From January 17-20, anti-mining activists from Mesoamerica and beyond gathered in the small Mexican mountain town of Capulálpam de Méndez, Oaxaca to say ‘Yes to life! No to mining!’. The event attracted nearly 500 participants from Mexico, Guatemala, El Salvador, Honduras, Puerto Rico, Argentina, Canada, the United States and Europe. Almendares spoke with Upside Down World about the negative social, environmental, and health impacts the mining industry has caused for communities in Honduras. Almendares pointed out that the unpredictable weather in Honduras makes the impacts of the mining industry even more serious, as he thoughtfully asked, “you remember hurricane Mitch?” From 1991 to 2010 Honduras ranked among the top three countries in the world in terms of the loss and devastation associated with extreme weather events. Mining operations leave tailing ponds full of toxic materials like cyanide, mercury and arsenic, which not only seep into the surrounding environment but can also become wind-borne in adverse weather conditions. Almendares also stated that heavy rains around underground mines near inhabited areas can cause “the destruction of the city,” as the foundations of whole towns may become unstable due to underground erosion. Almendares lamented the long history of heavy metal contamination by mining operations in Honduras. As there is little control or supervision of the industry, water sources have become tainted by lead and mercury. He went on to say, “We have arsenic and other heavy metals which have damaged the communities, particularly children, and you know the people who are undernourished are more susceptible to the damage of heavy metals…Cancer is growing, probably due to pesticides, heavy metals and also polychloride biphenyl. These toxins that they use in the electrical transformers, in the old-fashioned systems, we still have them.” To put this in perspective, polychloride biphenyl – or PCB – has been banned in the United States since 1979 due to its cancer causing properties. There is also a problem in Honduras with acid drainage, where acidic water either leaks from old mining sites or from tailings ponds. “Acid drainage is a very strong phenomenon that lasts almost forever. The contamination lasts for more than 50 years, maybe 100,” warned Almendares. The water contamination has lead to an increase in the prevalence of skin conditions, so that people often suffer from rashes and skin irritation. People also end up with higher rates of infection due to not having adequate water in which to bathe. The environmental degradation is further compounded by poverty – “because they are also poor, undernourished, the immune system is more susceptible to fungus, to bacteria and other problems with the skin.” Futhermore, eye conditions, such as conjunctivitis and corneal ulcers, have also been recorded in communities impacted by mining. The toxic effects of the materials used in mining can also have harmful repercussions for the development of children. The toxins can “impact in the growing tissues…so they cause damage to the brain system, to brain development and they may also cause deformities during pregnancy.” Any health problems associated with mining are exacerbated by the lack of an adequate health care system in Honduras. “There is no protection of the community and most of the people who are affected are women because they use water…they wash the clothes, they cook and they carry water. Most of the health problems we have found have been dermatological problems, eye problems, respiratory disease, miscarriages in cows and women, and also we are getting more problems in itching. We have problems with the nervous system, depression and also the impact of deforestation and the dust,” he added. In 2011, Almendares wrote about the cover up by the Honduran government of a scientific report that revealed the adverse health effects of Goldcorp’s San Martin mine in the Siria Valley of Honduras. The report, which was suppressed for four years, showed that residents near the mine had elevated levels of lead in their blood and displayed symptoms of chronic arsenic and lead poisoning.Photographic evidence has also shown the detrimental effects of the pollution from the mine, which has devastated both adults and children. Almendares spoke out about the poor conduct of the mining companies, in terms of their lack of accountability and also the tactics they use to infiltrate communities. “There is no control by the government and there is also corruption. Not only of the government – they corrupt mayors and authorities at the municipal level,” he said. This was a familiar theme throughout the 4-day anti-mining conference in Mexico. Activists from Mexico, Guatemala and El Salvador also had stories of how mining companies in their regions have undermined local democracy to influence decisions in favour of unmitigated extraction and exploration, against the wishes of the communities affected. Further north, John Cutfeet, from the KI First Nation in Canada, described the ways that democratic processes were undermined in Canada to enable deeply risky business practices to go unchallenged. “We face similar experiences and similar tactics by companies and governments in order to try and access lands and rob of us our birth rites to those lands,” said Cutfeet. Almendares compared the damage from mining in Honduras to the situation in Mexico. “I will say that they are similar situations. The difference is the dimension of the damage, because we have been extremely damaged in Honduras by the mining companies for a long time,” said Almendares. He visited a large mine in Mexico and said that the mining process was more accelerated there than what he has seen in Honduras, noting that, “In Honduras we see these problems after five or six years, but in [Mexico] you see it before that.” He said there are a high number of premature births near the Mexican mining site, which is cause for concern. 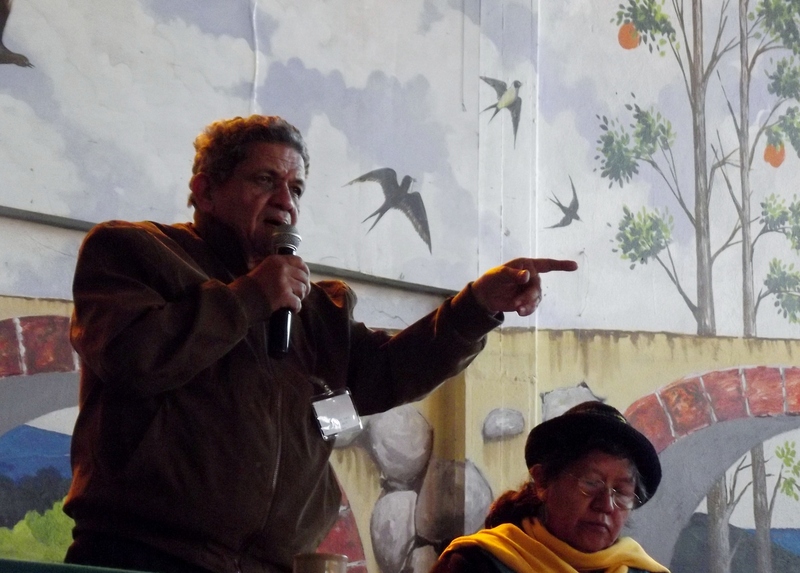 “Mining is really a terrible system for the lives of the people,” Almendares concluded. Jen Wilton and Liam Barrington-Bush currently live in Oaxaca, Mexico and report on social and political issues related to Mexico and Latin America more widely. Jen tweets as @guerillagrrl and blogs at Revolution is Eternal and Liam tweets as @hackofalltrades.